There are probably hundreds of types and brands of portable air compressors and tire inflators out there on the market. With such a wide range of variety, it can be overwhelming for many car owners to choose which product is actually worth buying. That’s why we decided to make a quick yet comprehensive portable air compressor review and product guide. In this review, we’ll take a closer look at the key features of what many car owners consider to be the best portable air compressor—the Tcisa Portable Air Compressor Pump. Tcisa Portable Air Compressor Pump is a heavy-duty yet easily portable tool that you can stash in your car’s trunk or in your home’s garage. Its key features include a smart preset inflation w/ auto shutoff, a backlit LCD digital display for its inflation gauge, bright LED lights, and fast inflation rate of 35 liters per minute. The Tcisa runs from a standard 12V cigarette lighter socket that can also be used with a wall socket adaptor, so it’s easy to use both on the road and at home. Its package contains three nozzle adaptors that make it convenient to be used with other types of inflatable items like balls and PVC boats. Its other selling points also include a durable build, user-friendly operation, multi-purpose function, and a lengthy 10 ft power cable. The product package also includes nozzle adaptor for PVC boats, adaptor for inflatable, ball needle, backup fuse, handy carry bag, and a user guide. • Smart preset inflation – We found this preset function relatively easy to manipulate because there are no complicated steps needed just to achieve the desired pressure value for inflation. To inflate tires using the preset pressure function, you just press the “M” button on the gauge just below the LCD screen to set the compressor into preset mode. Then you just press the “+” and “-” buttons to select the pressure value you’d like to use for the tire or item you need to inflate. It’s as simple as that. We think that the key to proper inflation is by knowing exactly the maximum recommended pressure value for the items you plan to inflate using the Tcisa. If you are unsure of how much air pressure the tire or item needs, it never hurts to start with small values as a trial. Its auto shut off function is also a big plus to this feature because it prevents over-inflation of the tires and conveniently allows you to do other things while waiting for the inflation process to finish. • LCD display – We like how easy it is to switch the unit being displayed on the screen by just pressing the “M” button. The LCD screen is also just big enough to provide a clear display of the number values. The backlight is bright enough to make the screen visible in low light situations but also not too bright so it doesn’t overwhelm the numbers’ appearance, thus ensuring that you get the values accurately in preset mode. • LED lights – Another big plus for this product is the built-in LED lights that you can use as a “mini” flood light when you operate the air compressor in the dark. This is a useful safety feature that not many portable tire inflators have. • Portability – We found Tcisa to be quite heavy to carry around by hand, but it’s understandably what you should expect from a heavy-duty tool with high-performance motor like the Tcisa. Nevertheless, it’s light enough to be stored in the car. • Durability – As for its material build, Tcisa is obviously made to last. The compressor’s body feels compact and the motor is fully made of metal. The little noise it produces during inflation tells us that its interior is snugly put together so it produces less vibration and keeps the equipment stable on any surface. • Usability and versatility – The Tcisa is not only easy to operate but is also easy to connect to the tires and inflatable items. The air hose nozzle adapters are also handy when using the air compressor with other inflatable items. This makes it ideal to take along during holiday road trips and outdoor camping. 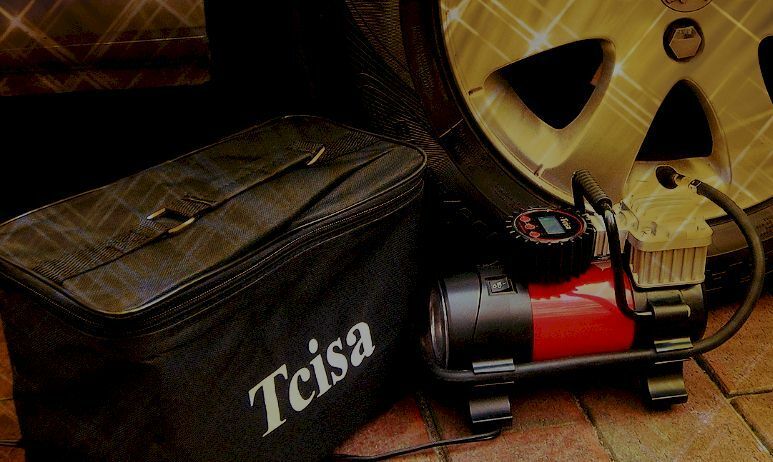 The Tcisa Portable Air Compressor Pump earned its reputation as the best portable air compressor because it features reliable functionality that rivals those of the more expensive brands and exceeds some of other air compressors in its price range. To give you some basis on this claim, we compared Tcisa’s features with two other portable air compressors that are also popular—the EP Auto 12V Digital Tire Inflator and the Jaco SmartPro Digital Tire Inflator Pump—in terms of inflation performance and price. This shows that Tcisa is a real star on its own, but it does have its own pros and cons. As mentioned before, the Tcisa Portable Air Compressor Pump is a multi-purpose inflator that can be used with various inflatable items. It can be used with motorbike tires, bicycle tires, PVC boats, balls, etc. That said, if you like going on adventure trips outdoors, or simply want to be handy around the home, Tcisa is a product you can trust. Based on the features and functionality highlighted above, the Tcisa Portable Air Compressor Pump proves to be useful in various times of emergency. Whether it’s a flat tire on your way to a life-changing business meeting, or a flat ball on your child’s first basketball game, this nifty tool can really help save your day. Therefore, based on what we covered in this portable air compressor review, Tcisa surely is one of the best portable air compressor pumps available out there.